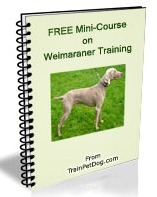 Selecting dog food bowls for your Weimaraner puppy may seem like a simple purchase. But, with Weimaraner dogs, you need to be careful that you don’t make a big mistake, that will cause serious medical problems later. There are a lot of dog food bowls to choose from, and they range from stainless steel dog bowls to plastic dog bowls, including slow feed pet bowls and even ceramic dog bowls. In addition to deciding what material to choose, you also should think about features. Some bowls are safer for puppies, and some are easier to clean than others. This labrador retriever puppy is watching an English Bulldog puppy eating from his dog bowl. 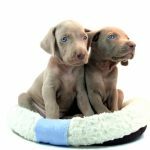 Weimaraner puppies need dog bowls that are safe for them. So how do you choose a dog bowl for your Weimaraner puppy? First, look for a bowl for your puppy that is sized for a puppy, and one that is safe and sturdy. And, of course it is always nice to have a dish that can be cleaned easily or washed in your dishwasher. Cleaning your dog’s bowls in the dishwasher will sterilize them and eliminate harmful bacteria and viruses. Dirty bowls can harbor germs that cause diarrhea in puppies. Also, try to find a bowl that doesn’t tip over easily, so you don’t end up with food or water scattered all over the floor. Weimaraner puppies can be clumsy, and they can be rough on their bowls! Puppy dishes come in a number of different materials, shapes and sizes. You will have to decide which type is best for your dog. Stainless steel puppy bowls are popular because they are bacteria resistant, easy to clean, and won’t break if your Weimaraner puppy plays roughly with them. Most can be cleaned in the dishwasher. Look for a non-skid bottom or a non-tip design, which makes eating quieter and keeps the bowl from tipping over or moving around. You may prefer puppy food bowls that sit on a mat and are held in place to prevent their moving around. If you find a dog food bowl with a weight in the bottom, all the better. Unlike plastic, your puppy can’t harm steel by chewing on it! Plastic is always difficult to keep clean, as small cracks and nicks can harbor bacteria. Also, puppies can chew off pieces and eat them–not a good thing for your dog’s digestive system! However, if your Weimaraner puppy does not chew his bowl, heavy duty plastic puppy food bowls can be a good choice. Plastic doesn’t break easily and many heavy plastic dog bowls have a slow feed feature, to help your dog eat at a moderate pace. This prevents your puppy from gulping down her food—and then gagging and vomiting. Why is this important? 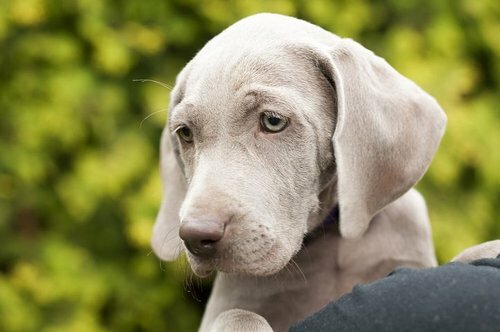 Weimaraner puppies and dogs are very prone to getting dog bloat, especially if there is a history in your dog’s ancestry. Bloat is often caused by eating fast and drinking too much water. Plastic dog bowls are generally very inexpensive. Especially if you have a playful or active puppy who pushes her dish around while she eats, you should avoid breakable bowls that sit directly on the ground. Dog food bowls like this can be personalized. You can get one here. However, some ceramic bowls sit in a frame or holder. And some glass bowls are tough enough to resist breaking. Ceramic dog food bowls are easy to keep clean and sterile, either by hand washing or washing in the dishwasher. Many can also be used in the microwave. With ceramic dog bowls, you may need to use a mat to prevent the bowls from sliding across the floor. Ceramic puppy food bowls often have cute designs and can be attractive and fun. This puppy dog food bowl takes meals to the next level. Made of silicone, it’s anti-skid, and it is designed to slow your dog’s eating. The feeder is soft and flexible, and it makes eating a kind of game. Do you work and have a busy schedule? When puppies are little, they need to eat often and on a regular schedule. With this automatic dog feeder, you can make sure that your puppy is fed the right amount and on time. It will release food, up to 12 times a day! If you decide to use an automatic feeder with your Weimaraner puppy, consider giving your puppy multiple small meals to avoid the risk of bloat. This automatic pet feeder is great for puppies or for cats, because it is small and you can moderate how much food they get! However, before you purchase one of these, do consider whether you want to make sure that someone observes your puppy while she eats. The type of puppy bowl you choose, is also dictated by your dog’s age and physical characteristics. For example, when some dogs get older and have joint stiffness and pain, an elevated feeder is appropriate and makes him more comfortable. However, elevated dog bowls are not a good idea for Weimaraner puppies or dogs. That’s because they are one of the dog breeds most prone to getting bloat. Finally for those of you who like to take your Weimaraner for a run or traveling with you, consider getting a collapsible travel bowl. The design of travel bowls makes them very portable (many even fold up when empty). The nice thing here is that you can be certain your pup stays hydrated on warm days, even if you’re out for several hours. On average a dog needs one ounce of water per pound per day, so gauge the size of your bowls accordingly. A 25 pound Weimaraner needs 25 ounces of water each day.